Programs for Kids of All Ages! Magician Muthukad has kindly consented to invitation from kids wing and visited on 08/03/2014 at Berwick Fields Primary school hall. Children enjoyed the interaction and dinner there after. Badminton tournament held on 16th October 2016 at badminton Centre, Hallam. Give general awareness for the growing generation about the Indian values,culture and arts. The recent Flood disaster which has battered across the state of Kerala in India has caused hundreds of casualties and catastrophic damages to property and livelihood of people. Unprecedented magnitude of economic support is required to reconstruct many localities from scratch. Phenomenal level of support is flowing in to the state from all over the world. Joining hand in hand, Pulari Victoria is driving a fund raising appeal to all our members, friends and well wishers to contribute in whatever way possible. 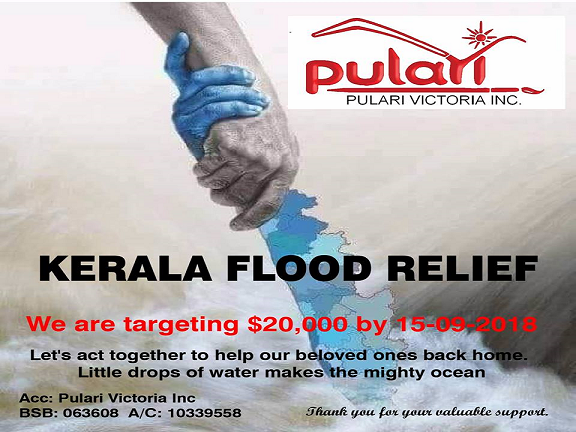 All the collected amount along with an added contribution from Pulari Victoria will be donated to relief fund that is authentic and fully verified by Pulari to be genuine. As you all know little drops of water makes a mighty ocean. So let's stretch a bit more than what we can and do our part for those who are reeling from displacement and property damages. Please visit our Facebook page to donate. All previous contributions Pulari has done is through the dedicated hard work of its volunteers and members. 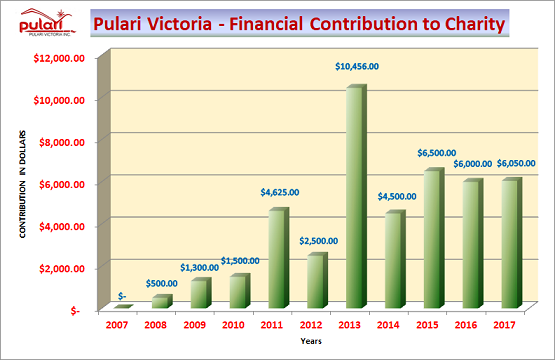 The graph below will give an insight of what Pulari has contributed to various causes in Australia and abroad during previous years. This appeal is first of its kind that Pulari Victoria has gone public and the reason is very obvious. The devastation caused by the flood last week as experts say will take years to recover and state and people need support from around the world to get back in shape. Pulari is a Non-Profit Organisation registered under Consumer Affairs of Victoria, Australia. A group of young enthusiastic people committed to contribute to the Indian community in Victoria paved the foundation of Pulari. * Explore talents within the community. * Give general awareness for the growing generation about the Indian values,culture and arts. * To organise programs involving local talents and overseas performers to upgrade and motivate our youths. * Raising funds for charity. Pulari started functioning in small way in early 2005 by actively participating in functions of MAV(Malayali Association of Victoria). It grew with great pace by conducting a series of sports and arts competitions throughout the year,viz: shuttle badminton, table tennis & chess tournaments for adults and kids. Consumer Affairs of Victoria recognised Pulari Victoria Inc as a non profitable organisation in september 2006. With the overwhelming support of our increasing number of sponsors for each programs we are sure that we can contribute much more for the community. We thank all of you for your kind support and contributions to our activities. 2018 At a glance …. *Contribution to various organisations and individuals as assistance. Pulari is a Non-Profit Organisation registered under Consumer Affairs of Victoria, Australia. -Develop a community that respects the need for charity. Copyright © 2019 pulari.org.au. All Rights Reserved. Joomla! is Free Software released under the GNU General Public License.